The burger parade is continuing as I look back at all my food pics and realize I've eaten a crap ton of burgers in this town! Ground meat and more ground meat along with some deep fried sides and stuff of course. Turns out there have a been many I found tasty and couldn't really narrow it down to just a handful otherwise I feel I might give short shrift to some out of the way places you may not have tried before. And there will be a couple that seem to always be on those "best of" lists from all those other review places because it seems I found them to be pretty good too. 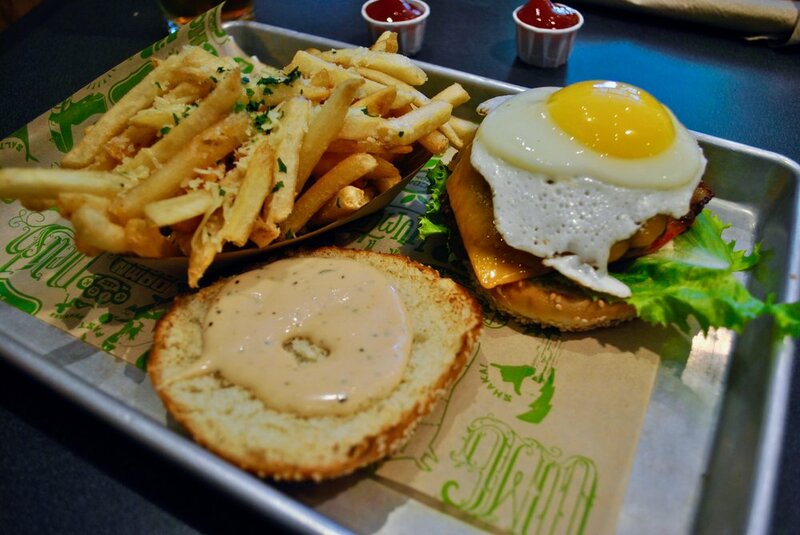 What better way to kick things off than with a bar burger! Hi Tops bar that is. First you really need to get over the fact it is a gay sports bar. I realize some folks aren't into either, but this place is big and fun and nice to hang out in and be casual. And watch sports, if that is what you are into. The food is quite good also, like the burger. Sure, I got a salad with it, so sue me, I wasn't in a fries mood that nice. Still, the burger is big and juicy and a perfect compliment to an assortment of beers they got. Now here is one of my go to faves, Super Duper Burger. This one has literally everything they offer on it, but if you want a decent priced burger, served up quickly from a homegrown spot that is also good eatin', you can't do much better than Super Duper. Fortunately for you and me, they have a number of locations around town you can easily pop into to get your fix of grilled meat and fries. Okay, so these guys are another mini chain spot around town and not everyone is enamored of them but the burgers are big and come with fries (or slaw or salad). 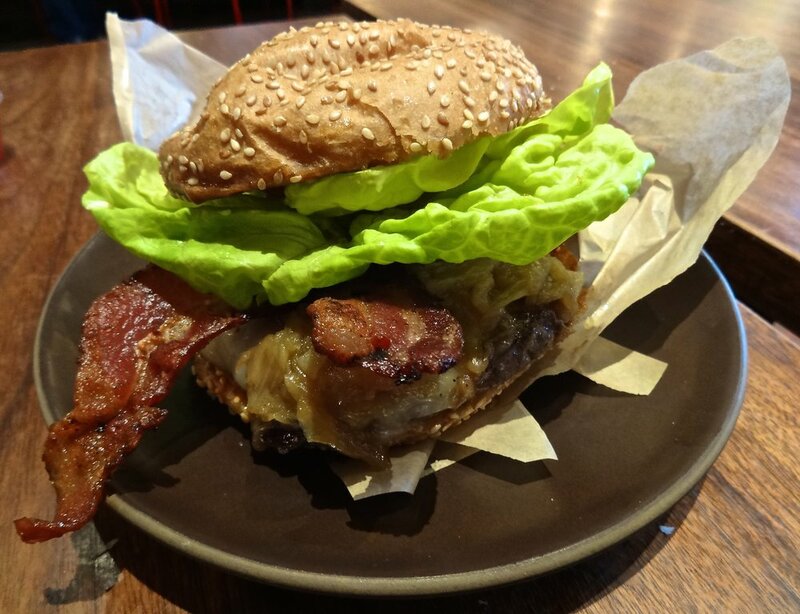 At BurgerMeister every burger is cooked to order and served up hot and juicy with copious amounts of toppings. They are like a greasy spoon that specializes in burgers. I've only been to the one in the Castro and remember when it first opened in that tiny underground like spot. I liked the burgers then and even though they've added more things to their menu, the burgers are the thing. Yes, I'm still on the SF chain thing, but I do sort of like Roam. I wish the burgers were a few bucks cheaper but the ones they make are pretty good. They do them with buffalo meat too, thus the Roam name, if you are up for it. Me, I'm old an old fashioned ground meater on my burger eater. Plus, bonus, they have zucchini strings here as sides which I could eat all day. Here's a hipster spot that is trying to give you the old school diner vibe with all the orange vinyl and mid-century modern furniture, Wes Burger N' More. 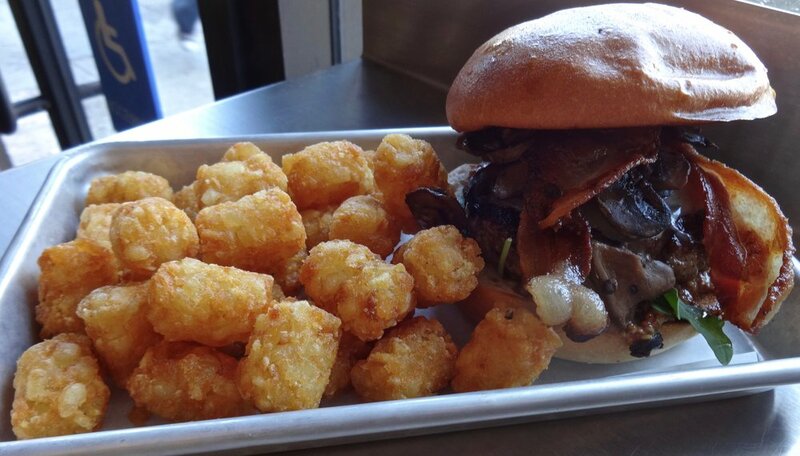 They are also serving up some juicy burgers that come with those tater tots! Price included! For that alone it was worth it. Having the burger with them helps too, particularly when you get the bacon addition for $2 more since you didn't have to spend any money on sides. Win, win all around. 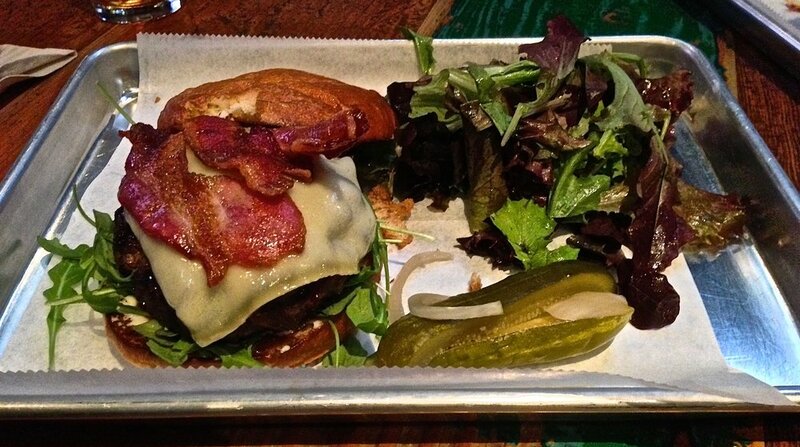 All right, here is one of those burgers which shows up on most everyones "best of" lists, the one from Garaje. I was dubious and put off by the price but in the interest of, you know, taste, decided to bite the wallet and splurge on the double cheeseburger for yes, $13 and then $3 for a side of fries with it. To be honest, I was a great burger with all the extra layers of cheese and their special sauce which is kind of like the stuff on a big mac but with a little kick. I know you may be surprised I'm recommending this since I rail against $10 sandwiches and what is a burger if not a sandwich? Here is my reasoning--the single is $10, but I say go for the double. For the extra $3 you get another of the large-ish patties on the bun. With the extra meat, suddenly it becomes a burger you could easily share and be satisfied by half of it since a half would still be kind of like a full burger. Thus you would be splitting the price of it with someone so it would cost you $6.50. Then you can split a basket of $3 fries, of which you also get a lot. That is another $1.50 added to your $6.50 meaning you spent only $8 for a burger and some fries. Unless you are a super sized kind of eater, I think you will find splitting the double and side of fries with someone will still give you both plenty of food. Trust me. Six down and I do have at least six more to go, including a burger I just wanted to bath in. I know that may not sound appetizing, but the burger definitely was. For now, enjoy the meat parade above and do yourself a favor--go have a burger with all your favorite toppings. It will make you happy.